At first glance AiRace Speed looks like a poor man's Wipeout, but what makes it different from Playstation's much loved title, and what exactly was Qubic Games vision when developing this title? In AiRace Speed, the objective of the game is to fly through each tunnel filled track in one of five available Jets within the fastest time possible, to score either the Gold, Silver or Bronze medal necessary to progress through the titles 18 different tracks within the game. 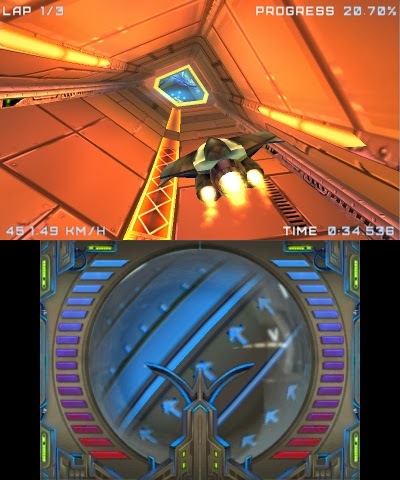 Unlike Wipeout, AiRace has you flying in all directions on the X and Y axis with a camera that's mostly locked into place, meaning you always have to fly in a set direction, but each level has multiple paths to choose between with both stationary and moving obstacles to avoid along the way. Ahh obstacles, why you no get out of my way!? In addition to this, each level is a time trial that forces you to test your own abilities, improve upon your speed and memorise each and every route in order to unlock the 42 achievements available to you. On a personal note, I feel the inclusion of multiplayer would have been both a huge benefit and a good selling point, but for a single player-centric title, the inclusion of online leaderboards should be enough for any gamer intent on becoming the fastest in the world. Graphically, AiRace Speed is a nice looking title. It isn't the best the 3DS has to offer, but it most certainly isn't the worst either and although simple in design, it still somehow manages to remain appealing to the eye. With levels of futuristic styling, neon lit walls and a good contrast in colour; it's relatively easy to follow each track. Plus, taking full advantage of the consoles 3D capabilities, AiRace does a good job in utilising all of the 3DS' capabilities with both 3 dimensional gameplay and a slick looking menu that stands out not just from great design, but literally also. 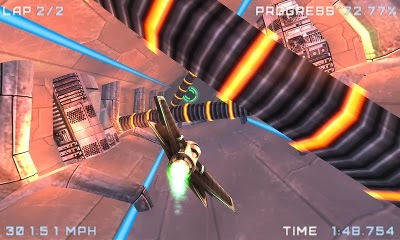 As for the sound effects, when accelerating and decelerating, the sound of your jets engine can often cut out which appears to be more of a glitch than anything, but aside from this small bug, the effects of a calming, ambient and entrancing soundtrack will quickly mask any issues you have with the sound effects themselves. The hub itself looks nice with crisp and clean graphics and an easy to follow layout. The achievements section lists every achievement you have and are yet to unlock, while the Start option opens up into a series of images which represent each of the 18 tracks on offer. Here you can also access the online Leaderboards to take advantage of that competitive spirit you may possess. Each level is fast and unforgiving and where some allow you to respawn an indefinite amount of times, others will only give you three lives, but at the same time each life you lose knocks off three seconds from the clock, so it's a pretty punishing title from the start. Of note, each of the level screens are colour co-ordinated, seemingly representing the difficulty of each area. If you're planning on completing the game, you'll need to have at least 9 gold medals before you can unlock the final track, and even then you'll have a difficult time finishing the game. How the game plays from both the top and bottom screens. If I were to criticise the title, I'd have liked to have been able to select which Jet I could use for each level, and although not necessary, a little customisation would have also been a nice addition to this otherwise decent title. My only gripes are that at times the game can feel a little too restricted in terms of linearity and although using the stylus is an option, when steering with the analogue stick, controls can vary between being too sensitive or too unresponsive, often making things feel a little clunkier than what I feel they should be. Like most 3DS titles however, the 3D effect can often make things more confusing than they need to be, so unless you can sit perfectly still when gaming, you'll more than likely try the 3D once and then carry on with it switched off for the rest of your playthrough. AiRace Speed is a decent enough title with a good deal of replay value for those wanting to invest their time in pursuing the array of in-built achievements on offer, but with several issues the experience is slightly lessened, however for a title that's only £4.59 from Nintendo's E-Shop, AiRace Speed has a lot to offer for such a small price and if its charm can't win you over, the leaderboards and achievements most likely will.